The special edition car will be limited to just 500 units worldwide. It gets everything that the standard M3 gets and ticks the ‘Competition Package’ on the options list. That bumps up power from the 3.0-litre twin turbo engine to a mouth-watering 444PS. The 0-60mph (96kmph) sprint comes up in just four seconds, a tenth quicker than the standard car. Geeky goodies such as the adaptive M suspension and the active M differential are standard as well. The exteriors get subtle tweaks as well. Updates include LED headlamps, some gorgeous 20-inch alloy wheels from the M4 GTS, and tricolour striping on the carbon-fibre roof. Moreover, there are two special paint finishes available for the special edition viz. Frozen Silver and Macao Blue Metallic. 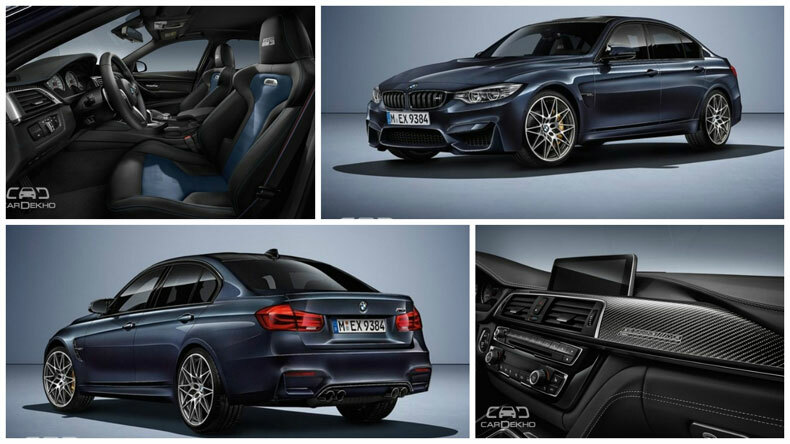 The blue shade has a bit of history behind it as well – it was amongst the optional colours for the first M3 ever made! The M3 has been the king of compact super-saloons ever since it first broke cover thirty years ago. Over the course of time, BMW has fettled with the recipe countless times. However, what remained constant through the years is the grin on the driver’s face when he mashes the accelerator into the carpet. Happy 30th birthday M3!